Philae is the name of an island located in the middle of the River Nile and Lake Nasser in particular. 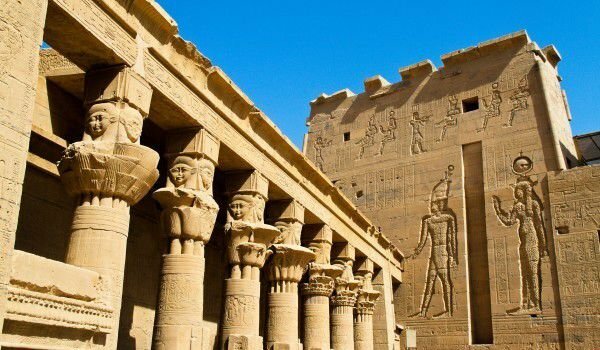 Located a short distance from the Egyptian city of Aswan, in southern Egypt, Philae is known for its amazing and seemingly magical temple of Isis. Once this island was a popular place for pilgrimages to the goddess of life, magic, fertility and family, has attracted pilgrims from around the world. Some believe that at Philae was buried Osiris - brother and husband of Isis, considered the patron saint of death. In those ancient centuries BC, Philae was inaccessible to all people and living creatures, except the priests. Myths say that even fish and birds are afraid to go near the Philae. The name of the island there have two interpretations - one from ancient Egypt and one from Greek. From Greek, Philae can be translated as remote or cape of the island. Ancient Egyptians called the island "P-aalek" which means both "near" and "creation". Since 1979 the island of Philae is listed as an UNESCO World Heritage Site. In fact, Philae is now completely submerged under the waters of Lake Nasser. The temple of Isis is brought in separate and careful numbered parts, then assembled at the nearby higher island Agilkai. Agilkai is located about 500 meters from the original island of Philae, and the reason for the relocation of the temple complex is the frequent floods in the early 20th century. Then, in 1902 was built the first dam of Aswan. It turns out that it is a threat and is able to destroy or submerge a large number of priceless archaeological monuments, including the Temple of Isis. In 1960, UNESCO launched the largest rescue in the history of archeology. The organization prepares special and careful plans for the transfer of endangered structures piece by piece to the designated safe areas. The actual transfer of the famous temple of Isis lasts for three years between 1977 and 1980 and was marked by great professionalism. Even the ground beneath the temple is formed from the the first island of Philae. Floods from the early 19th century unfortunately completely destroyed the floral motifs in the foundations of the temple walls, but everything else is almost perfectly preserved. The sanctuary of Isis was built around 370 BC by Nectanebo I. Later, the church was growing and is extremely important and popular during the reign of Ptolemy II Philadelphius (285-246 BC) and Diocletian (284-305 AD). Philae is one of the last monuments of Egyptian religion, coming from two centuries after the Roman Empire adopted Christianity. The sanctuary of Isis attracted many Greek and Roman pilgrims who come here to pray to the mysterious goddess of healing. The holy Island attracts many Greek and Roman pilgrims to pray for healing from the mysterious Egyptian goddess Isis. In 535, by order of Emperor Justinian, some rooms of the temple of Isis have been converted to Christian worship (a church dedicated to the Virgin Mary) until Muslims finally come.